Thinking about the formatting of 5e creatures while reading Hoard… Classic adventures put a short form stat block in, enough to use in a pinch. How easy is it to do that in 5e? Easy as anything it turns out. Compare and contrast. 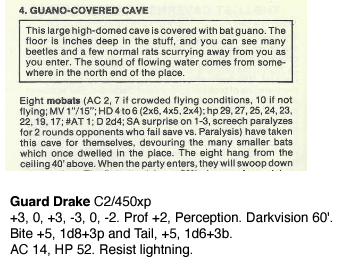 The Guard Drake gets full stats in the back of Hoard, though no additional text at all. I’ve included more in this block than I’d use if I were working from notes. I’ve not included Speed, as 30′ appears to be default, so why add it? The six stats are in order, just the mods here. The difference is I’ve added Proficiency (+2 in this case) so that the DM can cross the skill with any stat. That’s my preference, not everyone will share it. And I’ve not added the fact that the Drake can understand Draconic but not speak it, because, well, just because.